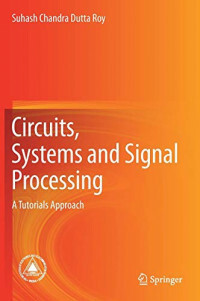 This book is a collection of tutorial-like chapters on all core topics of signals and systems and the electronic circuits. All the topics dealt with in the book are parts of the core syllabi of standard programs in Electrical Engineering, Electrical and Computer Engineering, and Electronics and Telecommunication Engineering domains. This book is intended to serve as a secondary reader or supplementary text for core courses in the area of signals and systems, electronic circuits, and analog and digital signal processing. When studying or teaching a particular topic, the students and instructors of such courses would find it interesting and worthwhile to study the related tutorial chapter in this book in order to enhance their understanding of the fundamentals, simplification of procedures, alternative approaches and relation to other associated topics. In addition, the book can also be used as a primary or secondary text in short-term or refresher courses, and as a self-study guide for professionals wishing to gain a comprehensive review of the signals and systems domain.